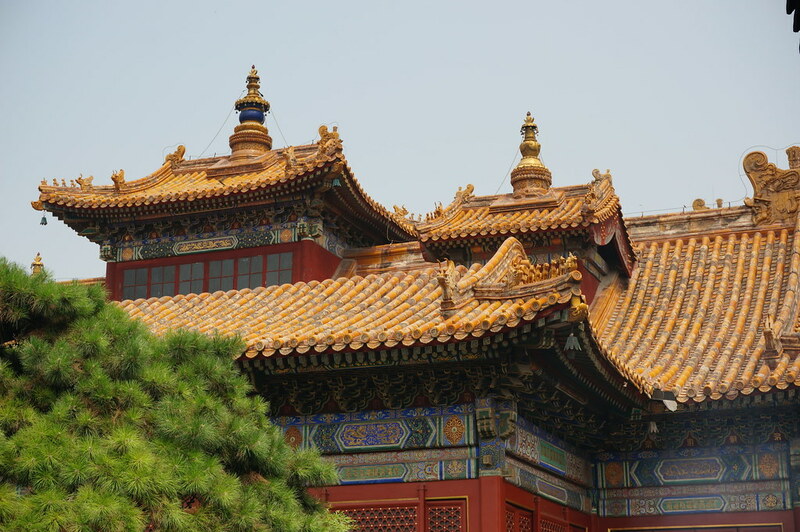 The first destination in Beijing was the Lama Temple. 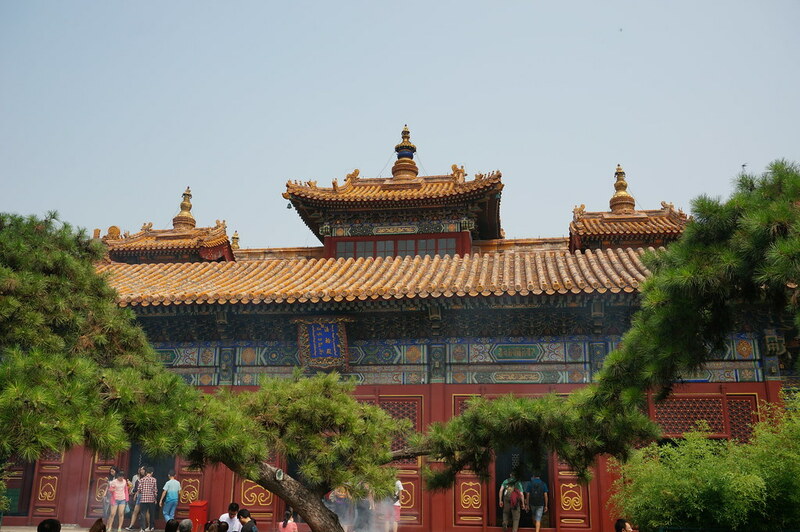 This had been a palace and was converted by an Emperor many centuries ago into a Buddhist temple, the largest Buddhist temple in China outside of Tibet. 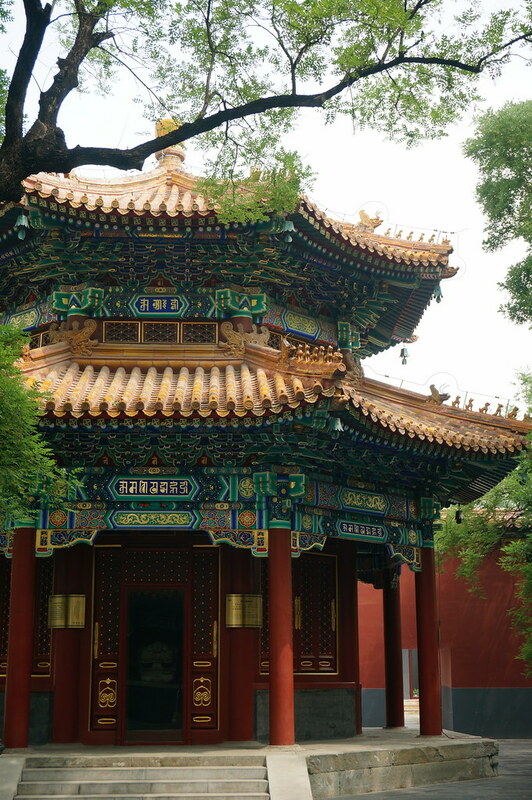 We wandered through the first few temples but it didn’t feel quiet right. 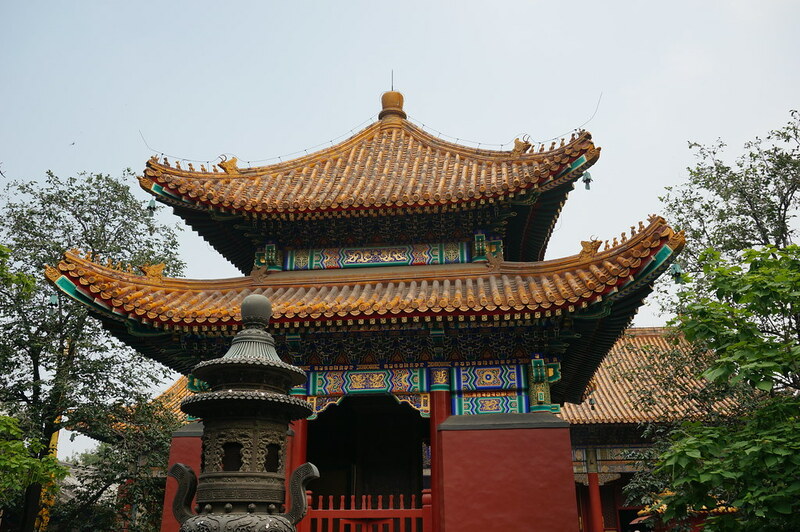 It looks like the usual Buddhist temples we’ve visited around Asia, but it doesn’t look like the Buddhist temples we visited in Tibet. It just looked wrong. 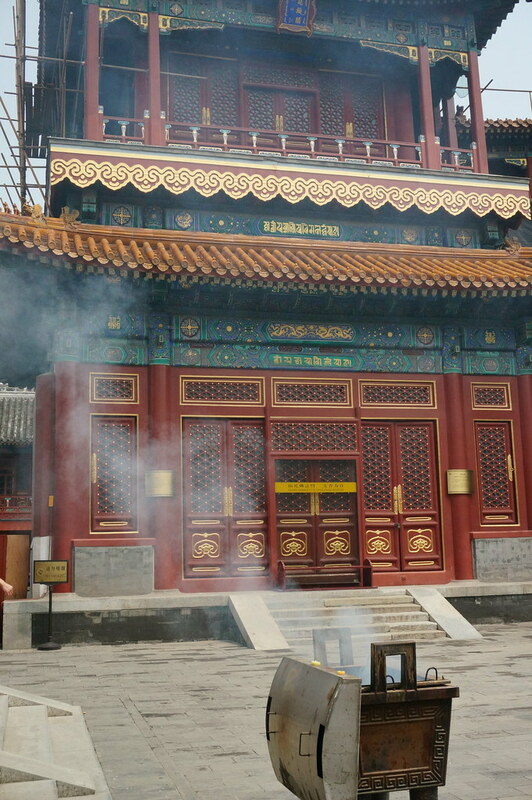 In addition it felt wrong, crowds of Chinese people carrying lots of incense sticks. Usually a few sticks are lit then placed in sand to slowly burn, but here there were piles of incense on fire creating huge clouds of smoke. We later found out that the incense was free by the entrance, which is why every idiot had them! 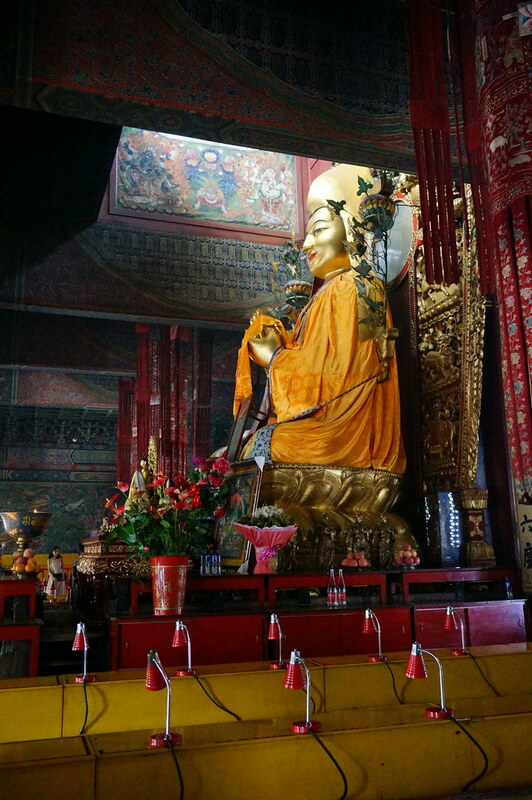 It looked nice enough but having seen the real thing in Tibet I didn’t care too much. Plus I’d paid £5 for the audio guide and it didn’t work most of the time. 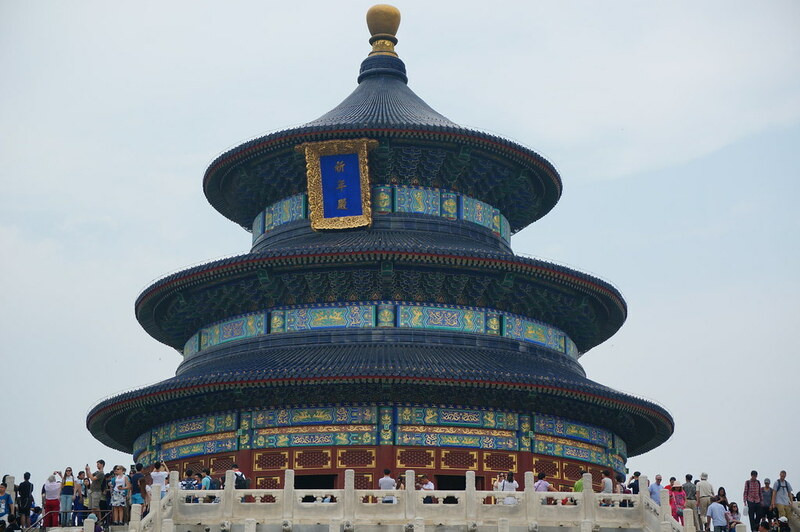 Next was the Temple of Heaven. 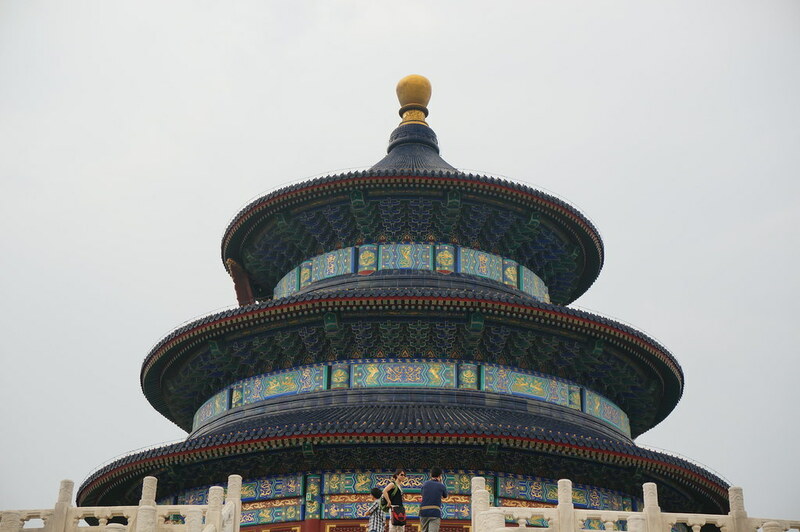 It’s actually a huge temple complex and the main temple is the Hall of Prayer for Good Harvests. 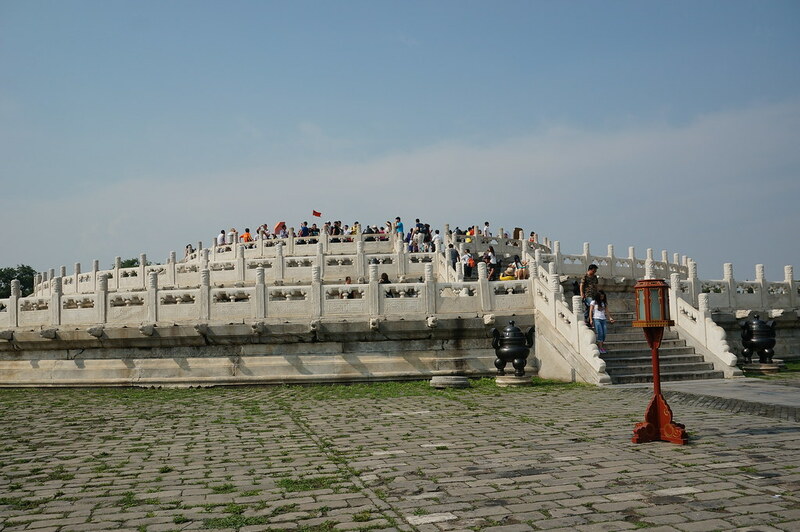 On a raised section of ground is the Circular Mound Altar for sacrifices. 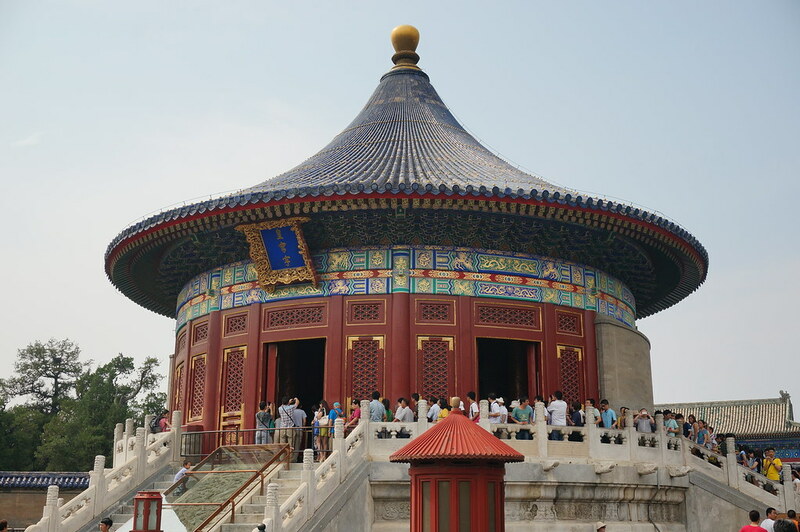 Then there’s a smaller temple in between the two, the Imperial Vault of Heaven, which is a smaller version of the Hall of Prayer for Good Harvests. Surrounding all this is an enormous park! 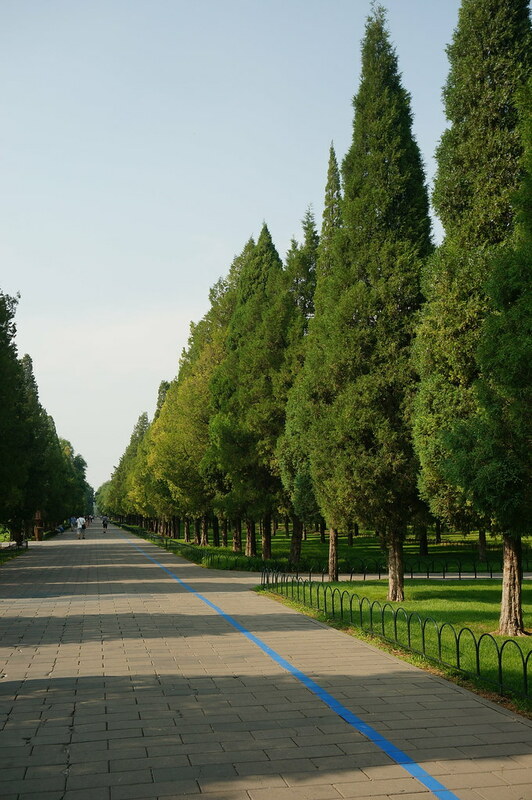 We followed the Long Corridor to the Temple of Heaven. 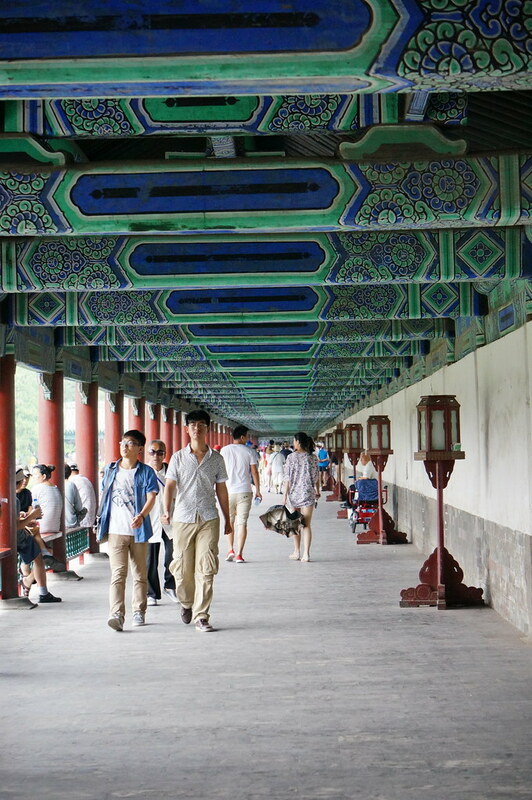 The Long Corridor is highly decorated and the paint is the usual vivid greens, reda and blues. There were many people sat playing Majhong. 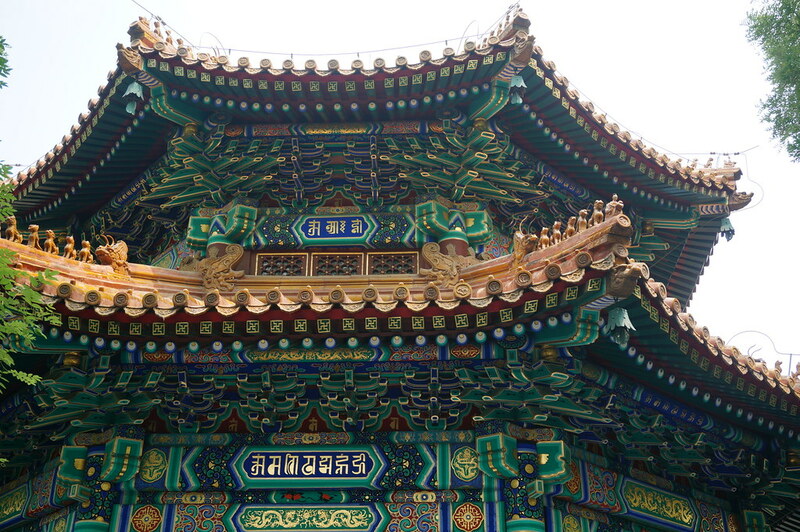 The temple itself is a strange looking temple, very different to any other temples we’ve seen elsewhere. 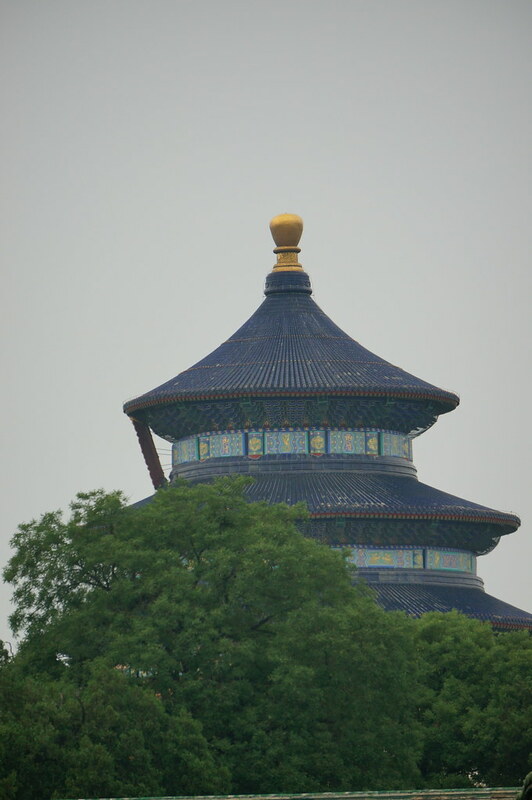 It’s circular and has a vivid blue roof. It must be unique and is certainly distinctive. 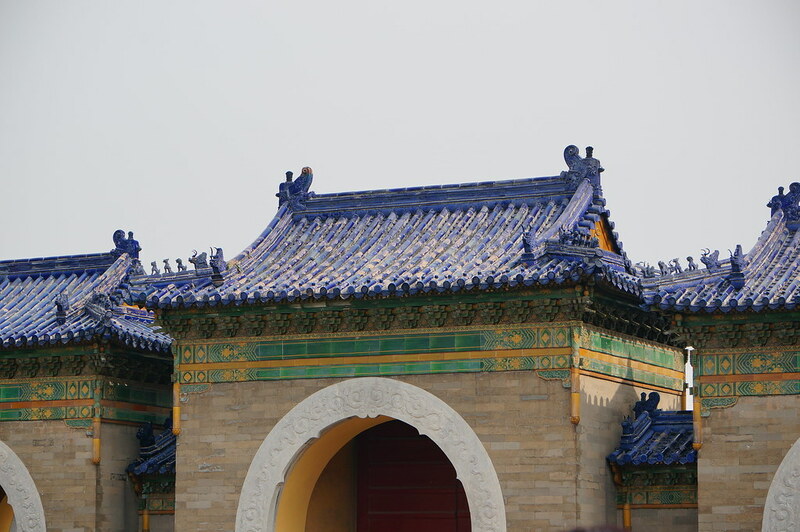 The blue represents heaven and the green tiles are the earth. 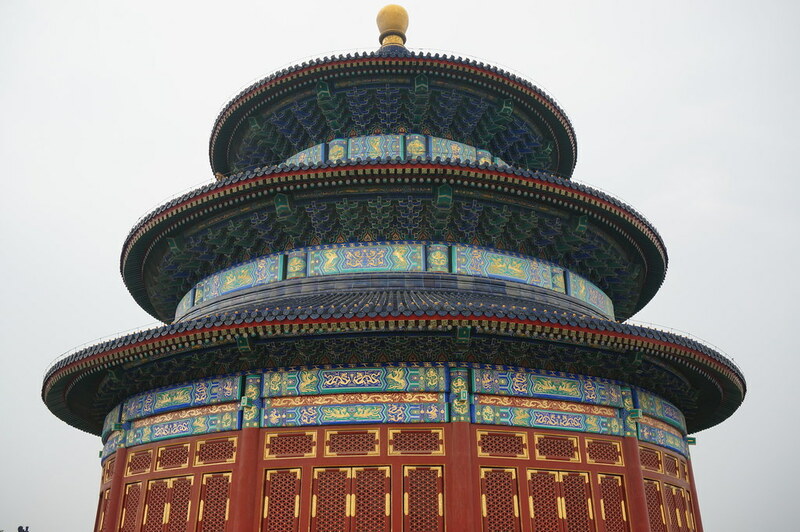 The main use of the temple was a ceremony to pray for a good harvest. 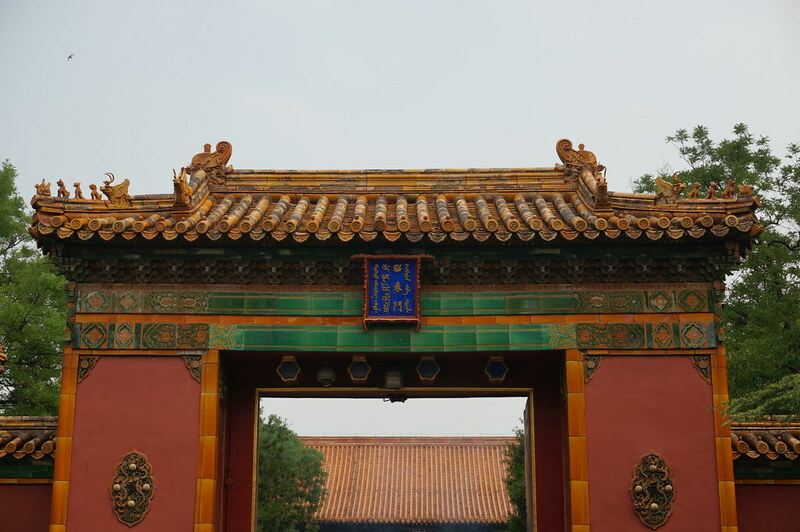 The Emperor came here twice-yearly and we later found out went to the ‘fasting temple’ where he would spend a few days fasting from his life of debauchery before making his way to offer a sacrifice and then to pray to the Gods. 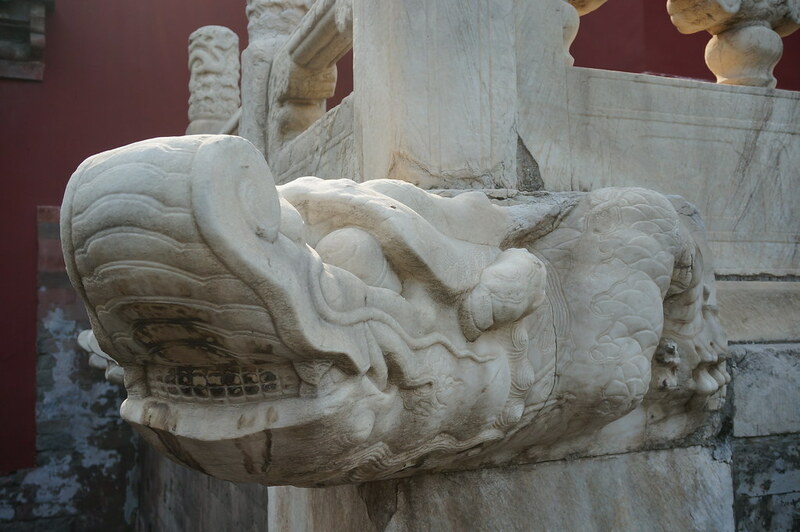 The temple is not the original, having been destroyed by lightning in the early 20th century. 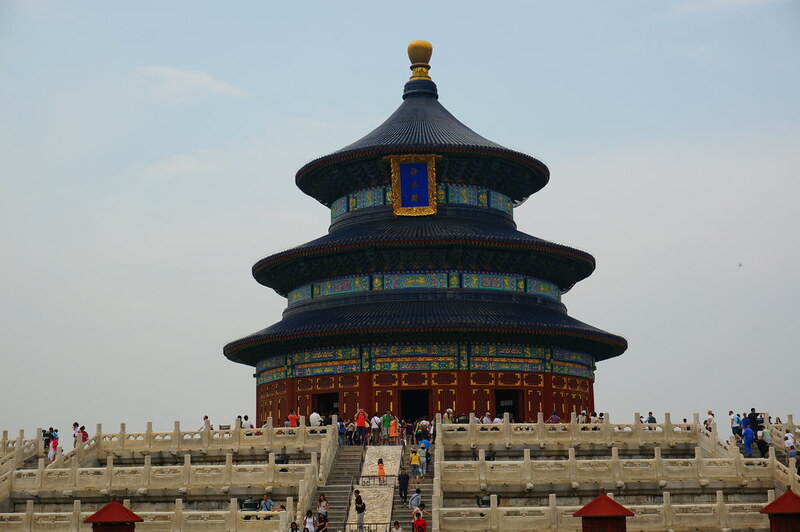 Surprisingly, it was not destroyed in the Cultural Revolution for reasons unknown to us. 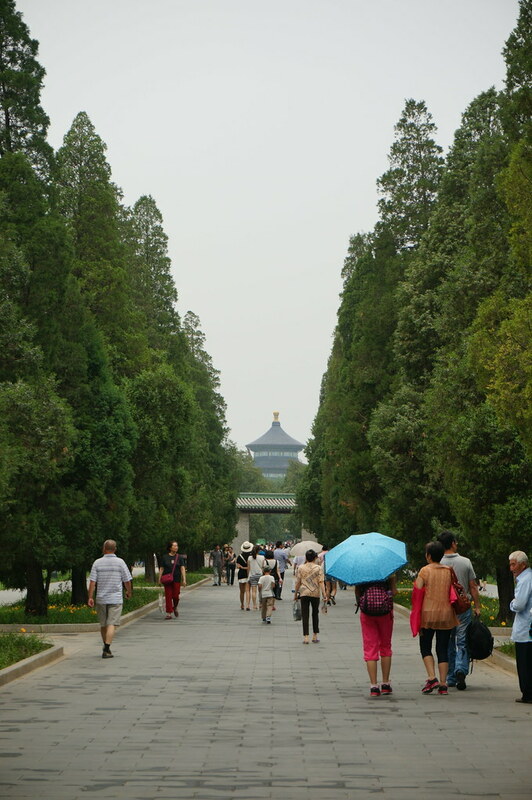 From the temple we walked to a huge walkway that led to the Imperial Vault of Heaven. 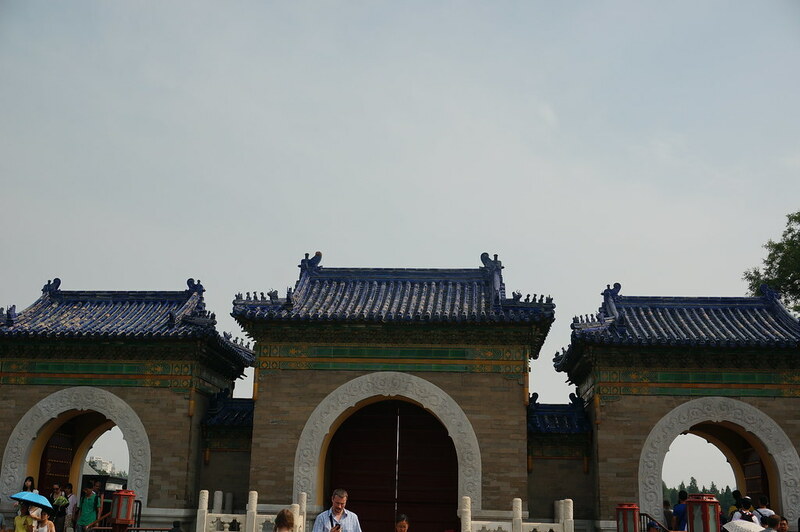 This building is a smaller version of the other temple. 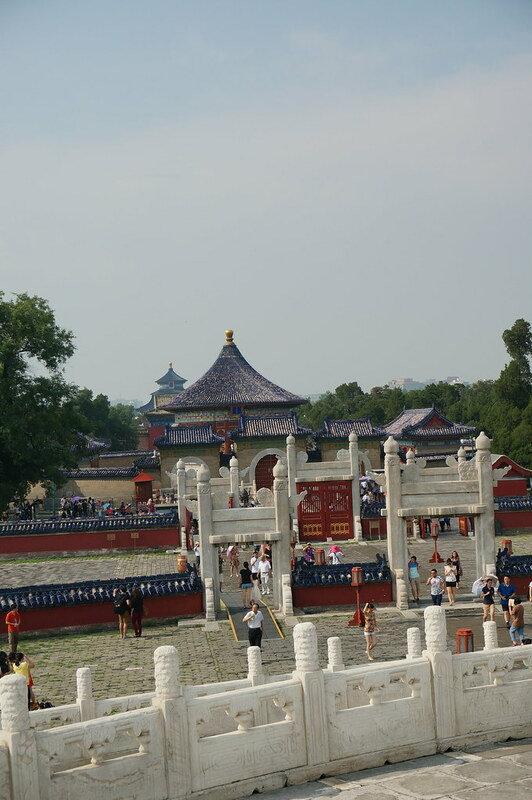 The smaller temple was near the Circular Mound Altar. This certainly was impressive architecture. 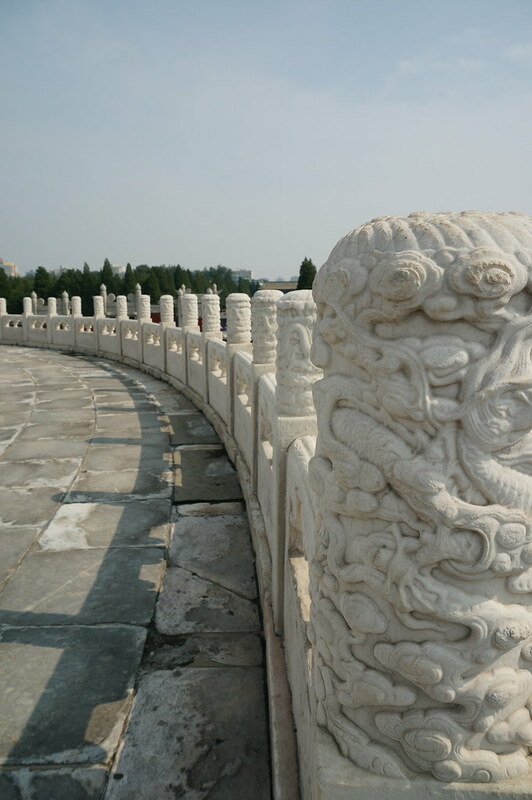 This part of the complex was where the actual sacrifice took place and it was said that even the slightest mistake would bring bad luck to the whole nation. There must have been some pressure on the emperor when he was here.The altar is three stages high and surrounded by decorated marble balustrades. Then we set of to wander around the gardens. They are really huge! 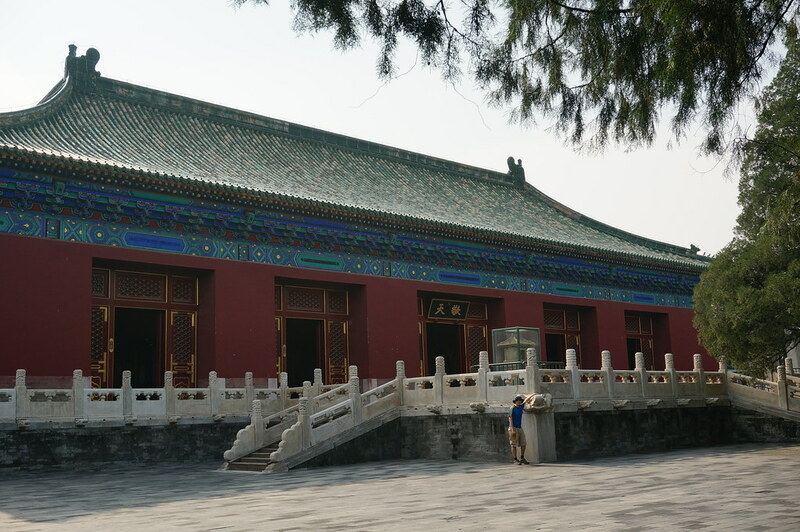 We spent over an hour walking and only saw another temple complex in the west of the park. We finally left around 5pm having spent all afternoon in the temple complex. We ate noodles from a cart just outside the park. I made a big mistake here. Because we order noodles from street sellers so often and price is always around 5-8 RMB I didn’t bother to ask the price. When I came to handing over the cash they turned out to be 15 RMB each! I bet they weren’t and she just doubled the price specially for us… Apart from that it had been a very good day. 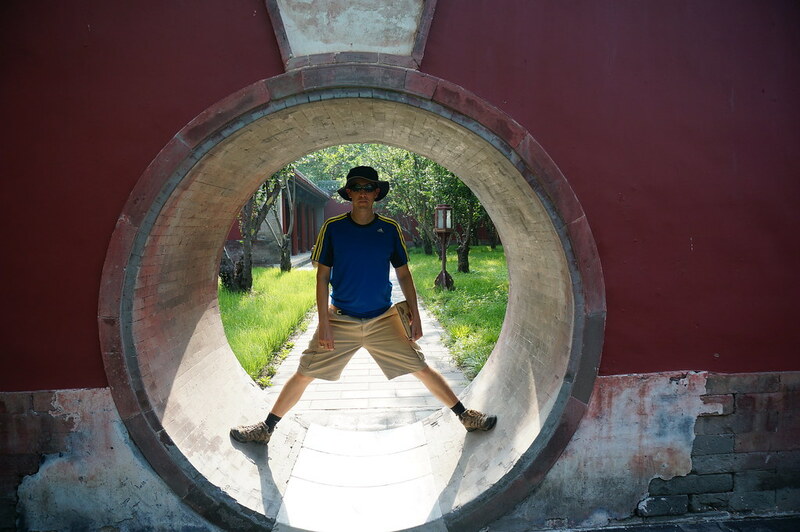 Posted from Beijing, Beijing, China.